Specifically designed for the '97 Cherokee body-style, the bumper features bolt-on endcaps and rear rocker guards. 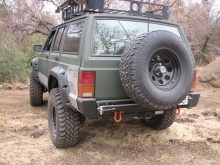 As with our original rear bumper, it's also constructed of 3/16" and 1/4" steel. 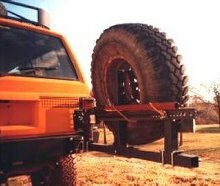 Bumpers are predrilled for our tire carrier, unless ordered otherwise. Black powder coated.